There are 2 classic pastries, kruche and półkruche in Poland & the most difficult part is trying to get a good translation of the names. 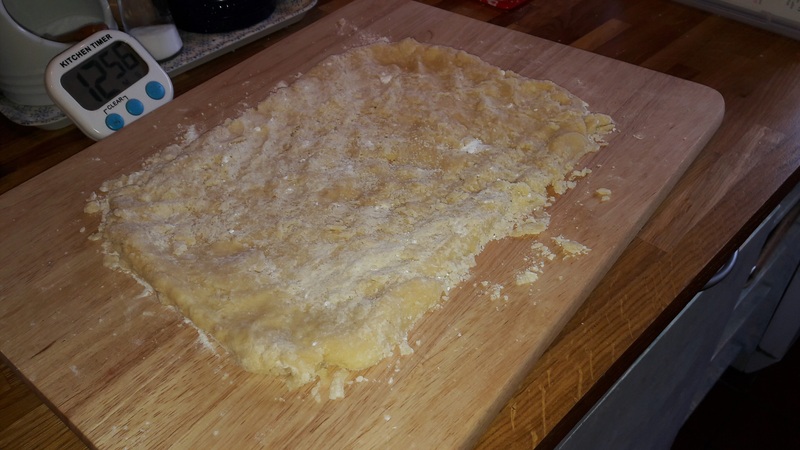 Ciasto is pastry and the word kruche means brittle, fragile or crumbly and ciasto kruche is often translated as shortcrust pastry – however it is quite different to British shortcrust pastry. This pastry is used to make a Polish cake called Mazurek of which there are many version. The pół part of the word półkruche means half or semi – but semi-shortcrust pastry does not really explain much! This pastry is often used to make a Polish cake called placek – future posts will describe how to make these. Both of these pastries are much richer than shortcrust pastry. Use a flour which is low in gluten – a cake flour not a bread flour. Butter give the best results but block margarine can be used . The pastry is fragile due to its high fat content. Use egg yolks (raw or hard boiled ), because the protein in the whites reduces the fragility of the dough. Using cooked egg yolks results in greater fragility. A pinch or two of salt. 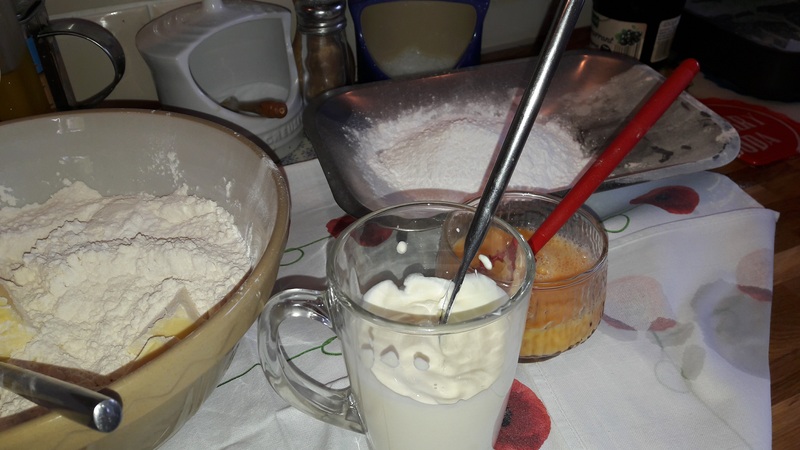 Here flour, butter, icing sugar and egg yolks (and a pinch or two of salt) are used but there can be other additions such as baking powder, egg whites and soured cream or milk, granulated sugar or vanilla sugar . The proportions of the main ingredients are different in that półkruche has a lower fat content. Both kruche and półkruche are baked in an oven heated at GM5 – 190°C or GM6 – 200° C, for 20 to 25 minutes. Add a pinch of salt to the flour. Use a knife to cut the chilled butter into small pieces into the flour and then use your fingers to make the mixture like breadcrumbs. Add the icing sugar and mix this together. Add the yolks and gently mix this in then and bring it all together into a dough – try and handle the pastry as little as possible. 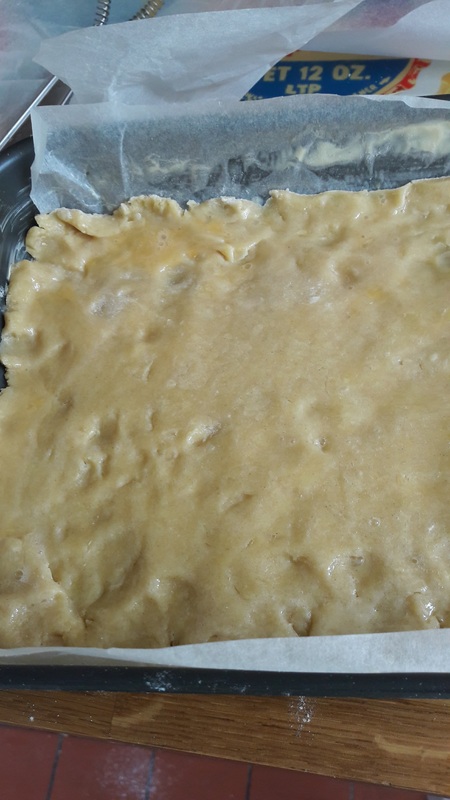 Wrap the dough in greaseproof paper and avoid touching the dough with warm hands, as it increases its temperature and this leads to increased use of flour. 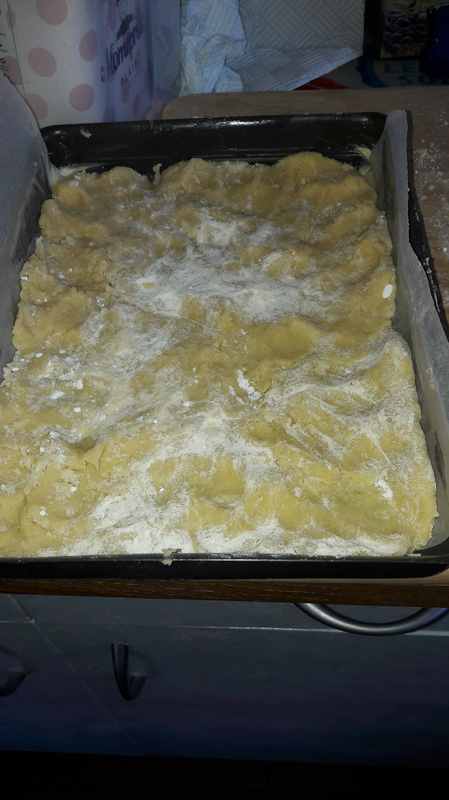 Once the dough has been kneaded, cool (about 20-30 minutes in the centre of the refrigerator) and then roll out to the desired shape and size. Roll out the dough and shape it as required. 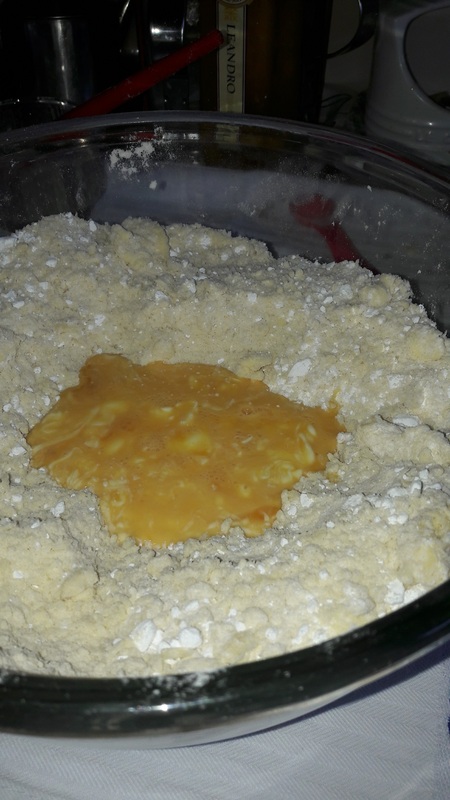 As this dough is very crumbly – I often find I have to piece and press the dough into the cake tin. I have seen recipes using hard boiled yolks and always thought “Strange! – having tried this out – I found that this is the best pastry ever! Delicious & crisp. pinch or two of salt. 1 – Hard boil the eggs for 10 minutes, allow to cool and separated the cooked yolks from the whites (this give you cooked egg whites to add to salads or similar). Use a fork to break up the yolks into very small pieces. 2 – Separate the raw yolks from the whites, then place these in a colander and cook over hot water (this gives you raw egg whites to use in other recipes). Add the broken up yolks and gently mix this in then and bring it all together into a dough – try and handle the pastry as little as possible. Wrap the dough in greaseproof paper and chill it in the fridge for about 30 minutes. Add a pinch of salt and the baking powder to the flour. Make a well in the centre and add the eggs, yolks and the soured cream and gently mix this in then and bring it all together into a soft dough – try and handle the pastry as little as possible. Because of the use of baking powder this dough is used straight away. I tend to flatten and shape this dough by hand rather than using a rolling pin. Make a well in the centre and add the eggs, yolk and the soured cream and gently mix this in then and bring it all together into a soft dough – try and handle the pastry as little as possible.